EPISODE 412: How’s That Working For You? The most unexpected moments can be our greatest teachers, so can this ONE question. Today’s episode is a valuable — short and sweet — reminder of what truly matters in life. Oftentimes we get so caught up in the things that don’t necessarily matter in our lives. We waste so much precious life TIME focusing on things that really don’t serve us, or the greater good. In a minute — a moment — life can change forever. We all need moments of truth that allow us to get back to what matters most. It’s here where we’ll remember our true purpose, and what matters most. Don’t waste a moment on what doesn’t matter or ISN’T working. Then YOU can decide what you’re going to do about it. You’re HERE right now. Make choices that are rooted and grounded in truth. In what matters most. Today. Don’t wait. It’s time to get your life working! If “it’s” not working for you, change it. Answer this question for yourself. How’s “that” working for you? Answer truthfully. From your heart. Make some decisions today to stay focused on the truth and living (AND LOVING) your life, my dear. 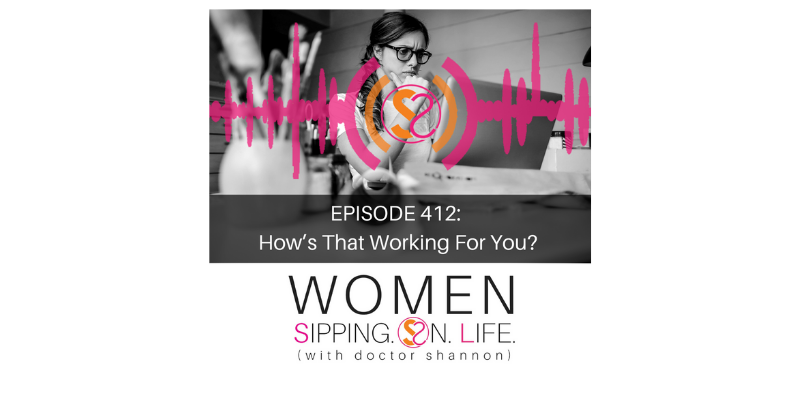 EPISODE 145: How’s That Working For You?Thank you for being here, and allowing me to sip on life with you.